At some point in our lives, we all experience some degree of anxiety or stress. It seems almost inevitable. Because stress can be at the root of many health issues, its management or alleviation is critical. Intuitively, people know that being in a calm state is the best foundation for a healthy life and, throughout history, people have turned to adaptogenic herbs to help ease tension and offer neuroprotective effects. Two such adaptogenic herbs include Ashwagandha and Rhodioloa. Ashwagandha is derived from a small shrub found in India, the Middle East, and parts of Africa. This exotic herb contains biologically-active compounds including alkaloids, steroidal lactones, saponins, sitoindosides and acylsterylglucosides, which may provide anxiolytic effects. Some studies show Ashwagandha does this by suppressing cortisol levels to calm the nervous system. For example, according to the Department of Neuropsychiatry and Geriatric Psychiatry, a prospective, double-blind, randomized, placebo-controlled trial was used to evaluate the effects of Ashwagandha on reducing stress and anxiety---and improving the general well-being of adults under stress. The study evaluated 64 subjects all with a history of chronic stress, and measured serum cortisol levels combined with a standard stress-assessment questionnaire. The group was divided into a placebo control and a “treatment” group that received 300 mg of high-concentration Ashwagandha root twice a day for 60 days. 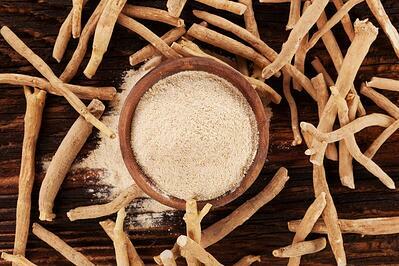 The group given the high-concentration full-spectrum Ashwagandha root displayed a significant reduction in scores that pertained to all stress-assessment scales on Day 60 relative to the placebo group. In addition, the serum cortisol levels were significantly reduced in the Ashwagandha group compared to the placebo group. They concluded that high-concentration full-spectrum Ashwagandha root extract provided significant anxiolytic effects. Also known as Withania somnifera, Ashwagandha is considered a Rasayana herb or “rejuvenating tonic” used in Ayurvedic practices to promote a healthy state of mind and increase happiness. According to the International Institute of Herbal Medicine from India, Ashwagandha enhances brain function and improves the body’s resistance to stress. In an animal study, Ashwagandha’s anti-stress effects were demonstrated with 100 mg/kg of oral dosage Ashwagandha. The results indicated an increase in plasma corticosterone level, phagocytic index and avidity index in rats subjected to cold swimming stress. In rats pretreated with Ashwagandha, these parameters were near control values and an increase in swimming time was observed. These results suggest that Withania somnifera (Ashwagandha) is a potent anti-stress agent, and the use of this herb helps induce calm in stress-related situations. During the swimming performance, Ashwagandha-treated animals showed an increase in the duration of swimming time compared to the control group. In addition, the cortisol content was reduced in the animals that used Ashwagandha. In the same study, Ashwagandha also provided a calming effect during a variety of stress tests, and reduced rat brain levels of tribulin, an endocoid marker for clinical anxiety. Ashwagandha also demonstrated an antidepressant effect during two standard tests (the swim-induced behavioral despair and the learned helplessness tests) indicating Ashwagandha’s profound effect as a mood stabilizer. Also, another study examining the effects of Ashwagandha on brain function showed this miracle herb regenerated atrophied neurites and synapses in severely damaged neurons, suggesting its reconstructive support in overall brain health. Some speculate that the rejuvenating properties of this Rasayana herb stem may from its ability to scavenge free radicals. Both the alkaloids and lactones may act as strong antioxidants, providing that added health benefit to the body, particularly in terms of healing and regeneration. Another adaptogenic herb, Rhodiola, also helps provide anxiolytic effects. Known as the “golden root,” this natural plant has been used to help boost mental endurance during stressful situations in harsh and cold climates. By slowing down the enzyme, monoamine oxidase, which helps metabolize serotonin and dopamine, Rhodiola is able to increase serotoninergic activity to enhance mood, increase focus and boost energy. In addition, Rhodiola changes cortisol production during emotional stress, helping to regulate our emotional and mental state. According to the International Journal of Psychiatry in Clinical Practice, a study was conducted on individuals with life-stress symptoms at work and within a social/family life context. Rhodiola rosea extract WS 1375 was consumed in subjects with life-threatening stress symptoms during an open-label study. This single-arm study involved adult subjects that were treated in general practice and received open-label Rhodiola rosea extract - 200 mg twice daily. The results demonstrated an improvement in stress symptoms, fatigue, mood, concentration, disability, functional impairment and overall therapeutic effect. These outcomes were observed after three days of treatment and evaluated for 28 days. In addition, the study also showed positive effects on mild anxiety. For example, the students who had reported anxiety and stress randomly received Rhodiola rosea extract compared to a control or no treatment. They found that the Rhodiola group reduced their anxiety, anger, confusion and stress at 14 days, and a mood improvement was also witnessed compared to the no treatment group. Our modern world is filled with stressors that tax our nervous systems on a daily basis. Perhaps safe and well-tolerated adaptogenic herbs, such as Ashwaghanda and Rhodiola, may offer the neuroprotective effects we need.